Mesut Özil shocked — or not — the world of football Sunday night as he announced his retirement from the German national team after suffering racist insults from German officials and media, which caused global shock waves amid campaigns to eradicate racism in the football world. Citing racism and disrespect, Özil, who is of Turkish origin, said he no longer wanted to or could wear Germany's famous black-and-white jersey. Özil, 29, spent nine years on the national team, earned 92 caps and scored a World Cup win. He was attacked after the team was eliminated in the first round of the 2018 World Cup held in Russia. Right before the World Cup, Özil came under fire in Germany for meeting and taking a picture with President Recep Tayyip Erdoğan. Some criticism after the meeting, however, turned into racial abuse. Following his statements, Özil received and is still receiving mixed reactions from all over the world, especially on social media, most of which are supportive of the star's decision. Fellow football players were some of the first ones to side with Özil. Former Arsenal striker Kevin Campbell, who also played in Turkey for Trabzonspor, said that discrimination should have no place in the world, let alone football, over the issue. "You have helped Germany win trophies and then they turn on you. Be proud of who you are and your heritage!" Campbell said as he addressed Özil on Twitter. Julian Draxler, a German professional footballer who currently plays for Paris Saint-Germain, on the other hand, shared a picture of himself with Özil on Instagram. "Mesut Abi [brother in Turkish], your technique and style have opened the door to the national team for players such as myself! Thank you for everything you have done for German football. You can be proud of your many achievements," wrote the young star under the picture, both in German and English. Arsenal FC, the football team that Özil currently plays for, also stood by their player and showed support for Özil's decision. The team shared his picture on the club's official account and welcomed him back from the World Cup tournament held in Russia. Arsenal defender Hector Bellerin applauded his teammate for standing up to racism. "Surreal that someone who has done so much for his country on and off the pitch has been treated with such disrespect," Bellerin said on Twitter. In a first reaction from his former teammates, defender Jerome Boateng said, "It was a pleasure, Abi," using the Turkish word for "brother." In his analysis of the situation for popular football website Goal, Ronan Murphy supported the player's decision, calling it "right." "With the way he has been treated by the [German Football Association] DFB and the media in his own country, why would someone as talented as Özil continue to play for a team who does not respect him?" Murphy questioned. According to a sports website SB Nation writer Zito Madu, the fallout from Özil's meeting with Erdoğan and subsequent abuse was predictable, "because the criticisms of him in the German team has [sic] been bigotry disguised as analysis. It never really mattered what he did, he wasn't wanted." "What really makes this so stupid is that the bigots win. They've finally gotten rid of Özil. Him being in that team was so irritating to them and their conception of German identity, and now he's been forced to retire because the environment has become unbearable," he added. 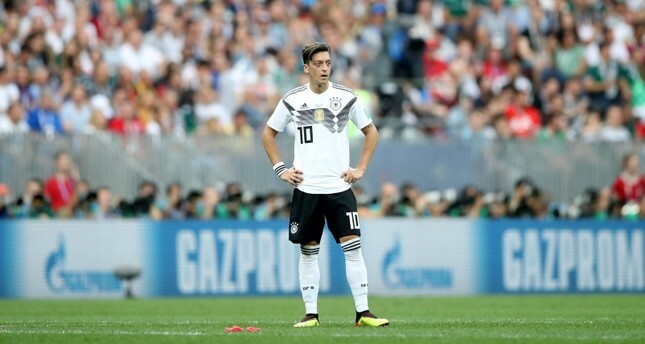 ESPN's Germany writer Raphael Honigstein said, "Mesut Özil's Germany exit [is] worse than any World Cup loss." "The most technically gifted player of his generation feels he can no longer represent the white and black colors due to racism. Let that horrific sentence sink in," he wrote. Former Norwegian striker Jan Aage Fjortoft congratulated all the people who have bullied the player into this decision. "The fact remains that one of Germany's biggest football stars, doesn't want to play for Germany any longer. And one of the reasons he highlights is racism. Bad news for all of us that think football can change the world," Fjortoft said. Özil's fiance, actress and model Amine Gülşe, who herself was a Turkish immigrant in Sweden, shared support for him on her Instagram account by writing, "I'm always by your side. I'm proud of you my love," under a picture of the two. Özil's decision drew massive support online with many fans calling it right. "Nothing but respect for Özil, honestly f--k racism and anyone who stands up for racists," one user wrote. "Sad that Özil retired from international football, but I can't blame him. No human being deserved to be treated like that, shame in the year 2018 people still discriminate," another said. One of the users also pointed out double standards in the Arsenal midfielder's treatment in Germany, saying, "Mesut Özil suffered racist abuse, was told to retire from the NT [national team] and made a public enemy for taking a photo with the president of Turkey. Meanwhile, Lothar Mathaus, who lead the anti-Özil hate campaign poses for photos with president Putin." German politicians, who are also main actors in the debate, did not remain silent over the issue. Justice Minister Katarina Barley wrote on Twitter Monday that it was an "alarm bell if a great German footballer like Mesut Özil no longer feels wanted in his country or represented by the DFB [German Football Association]." Federal Foreign Minister Heiko Maas of the Social Democratic Party (SPD), on the other hand, highlighted Özil's status at Arsenal, saying he does not believe "that living and working as a multimillionaire in England" has anything to do with the player's ability to integrate in Germany. On Twitter, he added that there are "many at least as important fates." Even the early departure of the German team at the World Cup in Russia had "little to do with the fact that Mr. Özil has been photographed with Mr. Erdoğan." The SPD politician called for moderation in the debate. "I think everyone involved in the cause should discuss it. I see few who, according to my perception, have behaved reasonably well there," he added. "A resignation because of racist hostility is an indictment of all. We're losing more than one top player right now," Maas said. The debate over the native Gelsenkirchener was "a turning point and very alarming for the state of integration in Germany and the debate about it," said Aiman Mazyek, head of the Central Council of Muslims in Germany. The North Rhine-Westphalian Integration Minister Joachim Stamp of the Free Democratic Party (FDP) has also called for consequences from the events surrounding Özil. "We need a big debate on the topic," Stamp said yesterday in the ARD morning magazine. "I think we just have to discuss … that our society has to accept everyone in their different ways," he said. "I am appalled by the resignation of #MesutOzil. I do not think that the error is only by a few people. A long career lies fallow after a photo. A world champion is being banned. Özil is deputy for many successful migrants. That is lived division," said Aydan Özoğuz, former Commissioner for Immigration, Refugees and Integration at the rank of Minister of State, on her Twitter account. Underlining that sports brings a lot to integration in a country, Chancellor Angela Merkel had previously said she respects Özil's decision. "The chancellor values Mesut Özil highly. He is a great footballer who has contributed a great deal to the national team," said Merkel's spokeswoman Ulrike Demmer, adding that he has "now made a decision that must be respected." Meanwhile, Özil's manager Erkut Söğüt responded to Bayern President Uli Hoeness' comments on Özil, which were the most outrageous ones among all those criticizing the player. Quoted by German newspaper Bild, Hoeness said following Özil's decision that he's glad that this nightmare is over. "He has been playing crap for years," he stated. "The last tackle he won was before the 2014 World Cup – and now he is hiding himself and his poor performances behind this photo," he expressed. "The comments of Mr. Hoeness miss the point completely, as they have absolutely nothing to do with football. He is trying to divert attention away from the real issue, the issue of racism and discrimination in Germany, which is resurging once again within everyday German society," Söğüt told Goal. "As Mesut said in his statement, he accepts reasonable and fair criticism of his football, and deals with that as part of the job. However, Mr. Hoeness cannot even provide any actual evidence to back up his foolish statements that are clearly exaggerated," Söğüt added. "Mr. Hoeness, we will not waste any more time or energy talking about a subject clearly you know nothing about. Not only is it a disgrace to yourself, but also and more importantly a shame to German football and the people of Germany," Söğüt further expressed. Turkish politicians also sided with Özil with overwhelming support. "An extremely accomplished footballer @MesutOzil1088 provides a perfectly reasonable explanation for meeting with President Erdoğan. But imagine the pressure under which he felt compelled to make this statement," said Presidential Spokesperson İbrahim Kalın on his Twitter account. "What a pity for those who claim to be tolerant and multiculturalist!" Kalın added. "I congratulate Mesut Özil, who by leaving the national team, has scored the most beautiful goal against the virus of fascism," Justice Minister Abdulhamit Gül also wrote on Twitter. Youth and Sports Minister Mehmet Kasapoğlu also expressed support for the player. "We sincerely support the honorable stance that our brother Mesut Özil has taken," he said. Yet, reactions were not limited to only footballers and politicians. Well-known Brazilian lyricist and writer Paulo Coelho also tweeted about Özil quitting the German national team. "Worth reading: 'I am an immigrant when we lose.' Regardless what they say, you were, are and will always be a winner, Özil," Coelho said in a tweet while sharing Özil's announcement letter at the same time.